Talk Nerdy To Me: First Day of Maternity Leave!! The best part of maternity leave (aka easiest) is probably right now. Just a 2 year old to take care of and my very pregnant self. I will be making sure that I take a lot of time to just sit down and read a book but I went a bit nuts this morning; baking, cooking, cleaning, groceries, marking labs etc. I would say the hardest thing at this point is running errands with Kai. I have to take him with me because Gary is way too busy these days so I can't wait til Gary gets home or everything will be closed! It's just tough heaving Kai in and out of the van/grocery cart and making sure he doesn't run away from me or throw a fit. The other day, it was the first time I was unable to follow through with a time out because he physically would not go and it was not worth it for my back to make him. I cut Kai's hair this morning. It looks wild I know, it will look better after a bath. 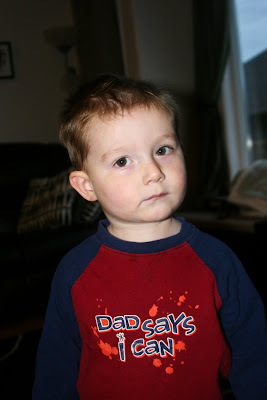 This is his `I can't believe you are not giving me any candy' face. Sorry bud but 8am is a bit too early for candy! 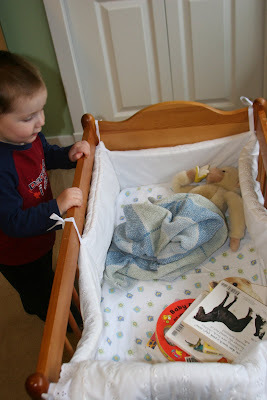 For about half an hour this morning, Kai read stories to the baby monkey and even gave it one of his Bubi's! It was really funny listening to him reading and talking the way I do to him. `This is a lion, do you know what a lion says? Do you know what letter this is? Point to the `D'!' At one point he yelled downstairs to me, `Mommy, I farted!' I said, `Kai, what do you say?' He said, `Excuse me!' . Then, he went back to monkey and I heard him say `Monkey, you have to say `scuse me after you fart'. When it was time for his nap this afternoon he started whispering and said we have to be quiet because the monkey is sleeping. Hmmmm...sounds like a pretty good big brother to me! I've decided to make fudge for my Christmas cookie exchange. I never make it and I never buy it because its so pricey so why not? So far, I've made 3 dozen...just go to make 2.5 more! I made a creamy maple/vanilla one and a rocky road one. I learned that Gary does not like marshmallows. Interesting. After 3.5 years of marriage, this never came up. Guess there's always more to learn! I just finished my marriage book and I'd like to do a separate post on that. I'd say that Gary and I are a pretty strong team based on what I read...woohoo!! Def. room for improvement but still, good to see all the areas we excel in! One last thing...Kai and I were able to go to Gary's first bball game of the year. They are in a tourney so the game was at 4:15pm. They won!!! Kai only made it to the half but I think they've got a pretty decent team this year so that's good. Room for lotsa growth, but still, not bad! Kai was cute, he danced when they pumped the music during a time out, he was trying to dribble during the half, and he cheered `Defense!' and `Go Justin!' without me asking him too. So cute. Okay, one MORE thing. I signed Kai up for a community sports class where a bunch of 2 year olds learn how to play several different sports. It starts in January and is just once a week. I'm hoping that he'll be able to run around a ton. He loves racing and playing sports but I'm not the best companion for that right now! I also signed him up for preschool in September and he got in. Although, he got into the afternoon class which was NOT my first choice. I guess he won't be napping anymore though, once he's three. I never thought I would be a person to sign my kid up for stuff because growing up, we could never afford it (my sister Maria and I took `painting and sketching' one year and that was it). However, our yard is not the tree farm that I grew up on so there's def. less to do at our house! I would eat it all!!!! That is why I am not baking a bunch of cookies this year...my poor kids and hubby. Congrats on being done! That is very exciting for you.